This diffraction grating calculator will help you find out what happens when the light hits a structure with multiple openings (slits or rulings). The light ray gets diffracted in various directions. Our tool determines the paths that light takes with the use of a simple diffraction grating formula. Keep reading to learn how diffraction works, or take a look at the Snell's law calculator if you're interested in other optics phenomena. Diffraction is a wave phenomenon that happens when a light ray hits an obstacle or a slit. After the light has traveled through the aperture, it changes its direction, what usually results in the wave spreading out. Diffraction grating happens when the light hits an obstacle with uniformly distributed apertures. Then, the rays get diffracted - each of them goes in a slightly different direction. The effects of diffraction are only visible if the spacing between apertures is larger than the wavelength of the incident ray. 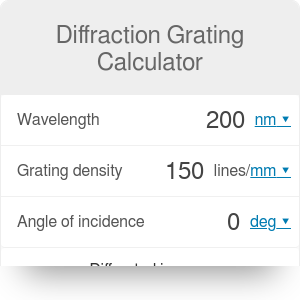 You can calculate the directions manually or use this diffraction grating calculator to do it for you! Diffraction Grating Calculator can be embedded on your website to enrich the content you wrote and make it easier for your visitors to understand your message.